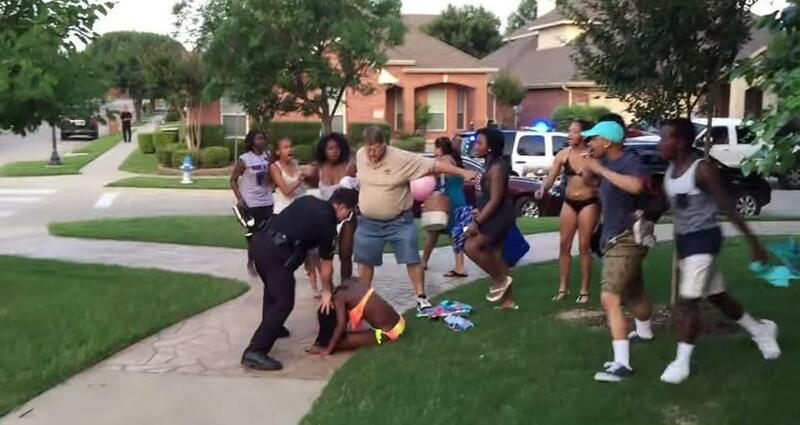 As the situation in McKinney continues to play out over the disgusting and disgraceful assault on a minor by former officer Eric Casebolt, I couldn’t help but notice there was an act of bravery seen in the now viral video. No, it wasn’t Casebolt and he clearly was not in danger of losing his life, as one recently removed principal suggested. It was a reflexive reaction of courage. It just wasn’t performed by any of the people in uniform. The country has watched the number of incidents of police brutality continue to mount across the country as cellphone and security video has been opening up a world of violence to white America that many either chose to ignore or didn’t know existed. The ease with which video can be taken and shared is exposing the reality that racism is far from dead and there are widespread systemic problems with the justice system in the US in regards to its treatment of minorities. The problems have been there for a very long time and now we are getting an increasing number of first-hand looks at it. Some in the privileged white community may think things were not like this or better in the past but not everyone was able to so easily film the Rodney King-like police offenses of yesteryear. Whether it’s police shooting children, someone running away, or someone doing exactly what was asked of them, it’s gone on forever and ignoring that reality is simply stupid. That said, the onus is heavily on the police to change their ways and mend the fences they continue to destroy. One way they can do this is commending citizens for recognizing when their officers are committing a crime and using their words (and not violence) to try to stop it. And this is exactly what some of the brave kids at the pool party clearly tried to do. When Casebolt begins his assault on the child, some of her friends instantly react to what was clearly an act of brutality. One of the young male teens even ends up in handcuffs for having the audacity of recognizing a crime and getting near ex-officer Casebolt when he was manhandling a child half his size. Casebolt maniacally responds to this offense by pulling his weapon. And that’s why it was so brave for these teens to even step near an out-of-control officer when he was clearly overreacting to the situation. It had to have crossed their minds at that point that they could end up being the next Tamir, the next Akai, or the next Freddie. That fear was put aside to stop an act of violence. It was put aside for what most of us recognize is a thing called morality. They saw their friend being hurt and they simply wanted it to stop. Even at the potential cost of their young lives, they tried to non-violently step in and do what was right and what was just. And there is no defending what Casebolt did in any way. His near-immediate resignation spoke volumes considering the lack of justice other officers have received in various incidents around the country. That resignation would not have happened so quickly if his actions were, in any way, defensible. In light of this, the McKinney PD should schedule a ceremony with all the bells and whistles they would bestow on their own. They should put on their fancy uniforms and line up in front of a stage to honor the courageous teens that recognized a crime being committed when they saw it and reacted appropriately. It’s the least they can do to begin the necessary repair of their now tarnished image. Re-posting this since nothing has changed this reality, including all of the variously disputed autopsy results. Officer Wilson performed his job poorly and, as the decision now looms very close, should be justifiably punished for his actions. As the situation in Ferguson continues to unfold, one aspect of the shooting should be examined profusely: the initial action of Officer Darren Wilson. The only witness to the initial contact outside of Wilson is Brown’s friend, Dorian Johnson, so this is a bit of a he-said-he-said. But, as has been widely reported, according to Johnson the first words between both parties were Wilson’s and they allegedly were, “Get the f— on the sidewalk.” This may seem insignificant, but it most certainly is not. We have to remember that police officers are supposed to be “peace” officers. In order to keep peace in every civil situation, a peace officer must deescalate the atmosphere, such as keeping angry combatants away from each other and calming them down to a level where talk can ensue. If Wilson did use those exact words when first contacting the two young men, he failed to do his job and actually escalated a calm situation. If anyone wants to dispute that, fine. Just show me where it says in any law enforcement training manual to start out every calm situation with a profanity while clearly disrespecting a person. In fact, we could even say there is a bit of racism in Wilson’s profiling of the men, which is easy to prove. If the person walking in the street had been an old white woman, would Wilson have used the same words and tone in the initial contact? How about a white man in an expensive suit? In defense of Wilson, let’s have all the old white women and rich white men step forward and tell their stories of how Wilson cursed at them when fracturing an incredibly minor law that was hurting no one. That would be the sound of crickets you are hearing right now. Simply put, if Wilson would have treated a different person with some actual respect, then his words and initial action should be heavily questioned. I’m not saying Wilson stopped because he is racist. I’m just saying his attitude certainly suggests there was a tinge of it present. And I know what the reaction to this will be: you are not a police officer so you don’t know what it is like dealing with people, particularly criminals, on a regular basis. Maybe so, but I do know a definitive way to make situations worse: treating people horribly from the first contact, which is what happened. And if a police officer has lost the ability to do this, maybe it’s time for another profession. All said, it’s Wilson’s fault this situation delved into a dead body in the street. Despite the clear attempts at demonizing Michael Brown, Wilson failed to do his job appropriately and that is why we are where we are now. Wilson deserves to be put on trial, just like anyone else would be in a similar situation if they were not wearing a badge.